Network device monitoring is critical to device availability – the simple probability that the device is available, up and running. And since devices, in spite of their ruggedness, can fail, availability is defined as an average between the time the device is down, and the time taken to get it repaired and running again. Device availability is almost synonymous with network uptime, and reduced availability in one device can clog the entire traffic and the failure/below-par performance of a single component could cause bottlenecks that slow down entire networks. 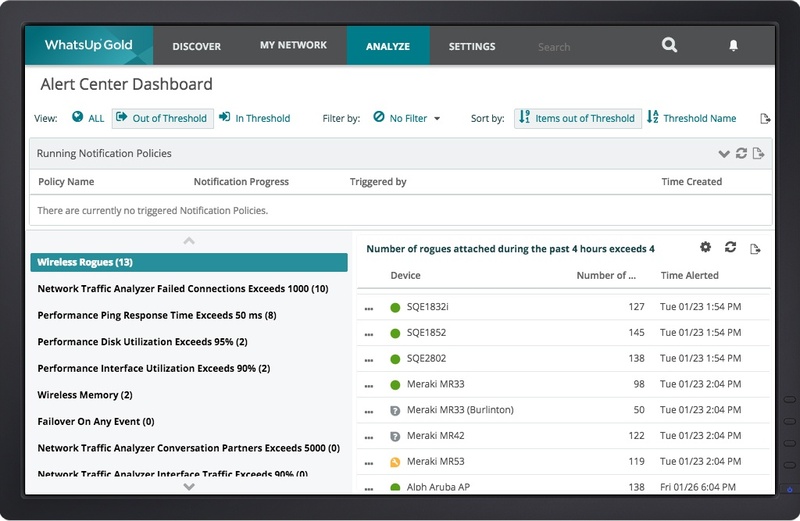 Your network monitoring software should be able to provide insights into the availability quotients of all devices in the network, based on availability metrics including device status, time to respond and downtimes. Physical and virtual user nodes, smartphones, routers, switches, firewalls, and business-critical applications should have an assured level of availability. WAN links too should be monitored for availability, both for connection issues and related network failures, as well as for drawing up SLAs. Network device monitoring software makes use of ICMP pings and SNMP messages to ensure each device is regularly contacted. Reporting is a necessary feature to look for here, since a network management system that can identify device failure and report almost immediately could result in lower downtimes. WhatsUp Gold offers a suite of network device monitoring services that can monitor and ensure availability across organizational silos. The monitoring software’s active monitors use SNMP v1-3, SSHv2 and WMI protocols to monitor network devices and hosts for availability (SNMP for Linux/Unix, and WMI for Windows systems). Passive monitors identify availability issues in near-time by analyzing SNMP traps and log messages. Reports and alerts play an important part in availability management. WhatsUp Gold’s Alert Center — with its configurable thresholds, escalating alert polices, and alert acknowledgements that pin down issue ownership – ensures business-critical applications and devices are fault-monitored and are made available 24/7. Additionally, by providing access to numerous pre-loaded reports through its core platform and plug-ins, the Alert Center allows network managers to come up with instantaneous graphing and access to archived data, thereby lowering the mean time to resolution.